"Delight your family with this elegant and delicious dessert." Leave stems on peeled pears. Sprinkle with lemon juice to prevent browning. Set aside. In a saucepan large enough to accommodate 4 pears standing upright, combine water and sugar. Place over medium heat, and boil until sugar is dissolved. Stir in vanilla, then place the pears in. Reduce heat, cover, and simmer for 15 minutes. Allow to cool in liquid, then drain. In the top of a double boiler, combine chocolate, cream and butter. Heat, stirring, until chocolate is melted and smooth. Remove from heat, and stir in coffee liqueur. Place pears on serving dish, pour chocolate sauce over pears, and garnish with maraschino cherries. I really didn't care for this recipe, but then I'm not a huge fan of pears. I found it a little too difficult to make for a so-so result. YUM! I'm not one for pears usually, but this was delicious. These were very good but I did use semi-sweet chocolate instead of the bitter since I didn't want my guests over powered with dark choc. 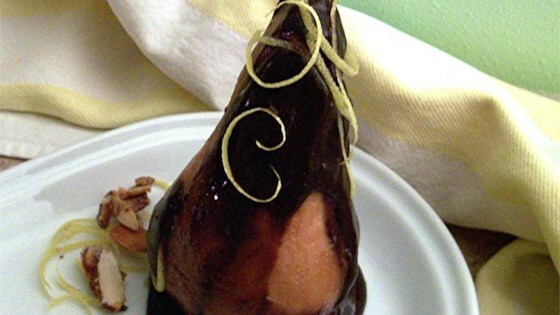 I thought the semi-sweet chocolat sauce worked very well with the sweeter pears. Will be made again! Awesome recipe even when using only 1/2 the sugar recommended in the recipe. A favorite from everyone in the family!